Trace the history of the Bible you own from original texts to modern English translations. Recommended for every study group, Confirmation class and church library. Use the downloadable questions and answers with your participants for an interactive class experience. The ancient people whom we know as the people of Israel of the Bible were convinced that God was intimately involved in their lives and in the destiny of their nation. Inspired by holy men of God, and judged by prophets of God, this people recalled, retold, and recorded their experiences and aspirations. The resultant writings, deemed sacred by succeeding generations became the Hebrew Scriptures, and the Hebrew Scriptures became known as the Old Testament. The people who knew Jesus were convinced that in him the word of God became flesh—Emmanuel—God with us. Those who walked with Jesus and those who experienced the risen Jesus—Peter, John, Paul and other—recalled and recorded the events in his life and the transforming experiences that produced and nurtured the Christian Church. As these writings were gathered, they became the New Testament. 1. "From parchment and papyrus . . ." Introduction to the story from ancient manuscripts to modern translations. 2. "The Vulgate . . . of the Common People." The Latin Bible is created to bring the Scriptures to a contemporary people. 3. "With patience and imagination . . . " Wycliffe introduces what could truly be called the first English language scriptures, but it would still require some patience and imagination on the part of the reader to understand the words. 4. "Lord, Open the King of England's eyes . . . " William Tyndale's famous last words set the action for the explosion of biblical translation in the English language. 5. "The greatest book ever published in the English language . 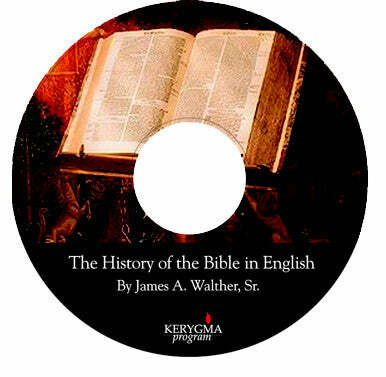 . . " The development of the King James Version remains one of the greatest literary and sacred works of translation and publishing even today. 6. "English is a dynamic fluid language . . . " There are good reasons for continuing the work of translation. 7. "Scores of new discoveries . . . " Archeological discoveries spur on a new century of translation. 8. "Many find these helpful in devotions . . . " Paraphrases are created to make reading the Bible easier for many. Written by James A. Walther, Sr.